Today I found out that the “S.O.S” in S.O.S brand scrub pads stands for “Save Our Saucepans”. The name was originally thought up by the wife of the creator of the S.O.S pad, Ed Cox. In 1917, Cox was an aluminum pot salesman. When Cox would introduce himself to potential new customers, he would give them a little steel wool pad that he had encrusted with soap as a sort of calling card. Eventually, these pads became more popular than the pans he was trying to sell so he began selling the pads and the rest is history. Contrary to popular belief, the last period in “S.O.S” was not left off due to an error in the trademark submission. In fact, they meant to leave it off because “S.O.S.” could not be trademarked thanks to the SOS distress signal often being written as “S.O.S.”, even though it’s not an acronym. By leaving the last period off, it made the name unique and, thus, the U.S. Patent and Trademark office accepted it. S.O.S pads received a big boost in world-wide popularity after inadvertently being prominently shown in a photo taken by William Safire of the “Kitchen Debate”. 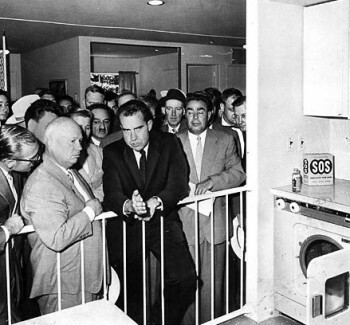 The Kitchen Debate was a series of impromptu exchanges through interpreters between Vice President Richard Nixon and Soviet Premier Nikita Khrushchev at the American National Exhibition in Moscow on July 24, 1959. This debate primarily took place in a half model of a “typical” American suburban house. 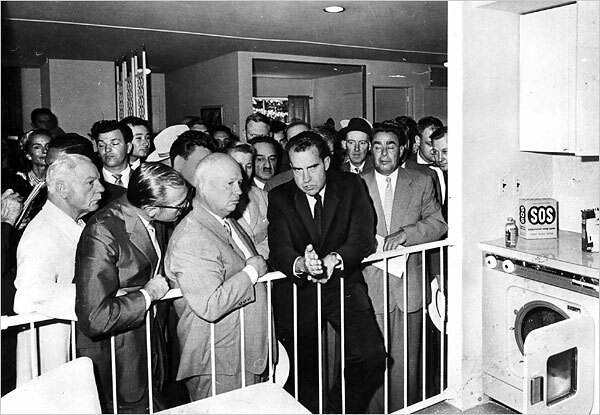 During the debate, Nixon and Khrushchev discussed the relative merits of capitalism vs. communism. Do we know that the S.O.S box in the mock laundry room was inadvertent? Maybe it was product placement…why would S.O.S pads be in the laundry room??? Nevermind I’m wrong it does mean absolutely nothing.